I have this pram. It is great! From eBay seller , delivery included. These are brilliant for an older toddler / child who is probably past the napping stage (although ours napped occasionally in it with a little pillow). We replaced our bugaboo bee with it. We live in London and it is fine on the pavements here and can do park grass (would be difficult on lots of cobbles). Very easy to manoeuvre - much more so than a typical umbrella folder. So ridiculously light I often chose to carry it on my back like a yoga bag and will unexpectedly take a very tall / heavy child. We chose this over a good quality Maclaren and never regretted it. Friends ditched their Maclarens after trying ours. Also easy to clean - just bung the seat in the wash. Can't fault it. RAVE! what have these got to be sold for such a high price ?? I got a basic pram very similar to this from Tesco at £10 and it did the job. for 15 times this price is this worth it? not at all. I'm definitely not one of those who is willing to pay for a basic thing just because of its brand. Having just gone through the process of buying a stroller for travel I really didn't see the benefit of these. In the end we went for a mamas &amp; papas one that weighs 1kg more but has more features, is way sturdier, comfortable and has a quick release umbrella fold that is more practical. We got them to sell us the display model as they were out of stock and paid £45. I was very happy as I was expecting to pay £150! Try BabyValue on ebay. They are always listing these on auction in various colours and usually sell for £200 new. Looking for this combination as well - the cheapest I can find is 360 at mothercare - any other better deals out there? hot hot hot, went for this deal yesterday, cheers mate, you saved me some cash. Think I got the last one, cheers OP. Happy Birthday to me! My little girl got this for xmas and loves it! Could do with more cushioning in the carrycot part in my opinion, bit to plastic! I can not find online..is it finised? 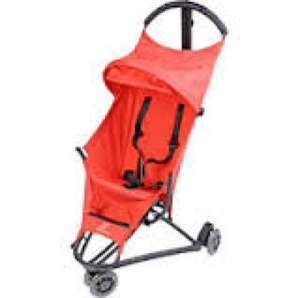 Quinny zapp stroller £110 at Kiddicare. Was £160. Cheapest I can find quinny zapp. Looking for a lightweight buggy but did not think the budget would stretch to a quinny zapp so well impressed when I found this. Also the basic Zapp doesn't come with a laying down function. So when they fall asleep their head flops forward. If you want a quinny zapp go for the xtra, which I think is the one that lays back. It's a good looking buggy, and it does fold and compact really easily. However once my child just under 2 it was no good for him anymore. His legs couldn't fit at the angle of the front of the seat. It just looked super uncomfortably. Also the basket at the bottom is totally pointless. Can't fit anything in it. It's a good looking buggy, but it's a lot of money for a buggy that won't last much longer then a year. 160 to begin with for a zapp sounds to much. i.bought xtra 2 for 200, really wouldnt pay over 99 for this one or just buy second hand for 50 ish. 2015 collection has new rain cover but cant buy them as of it. 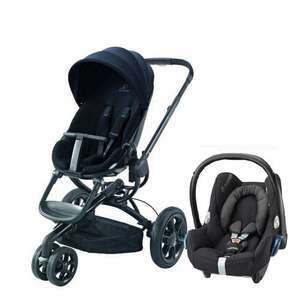 Best price I can find with base unit and carrycot. Free delivery fast and tracked and company looks to have great reviews. Shared Via The HUKD App For Android. Plus id not look at the price based on the fact it has a carrycot as they were £15 in smyths the other week. These squeek like a goodun, also just why they ask anything like this price for such an old pram is beyond me. Bugaboo is the best out there , we have had stokke , buggaboo , quinny, mutsy , you just cant beat the ride of a bug with no squeeks all the time. If it helps in terms of sizing, it will fit in the boot of a focus as-is, but you need to take one wheel off to get it in the boot of an A3. a friend bought this and regrets it now as it's quite big when folded up. wheels need to be taken off every time they put it in the boot of the car as the back ones are quite large. so would advise checking your car boot space if you haven't already done so. Just picked mine up, it's the pushchair with seperate pram part too!!! Even hotter from me!!! amazing i spent £50 on this ordered a few for presents!! 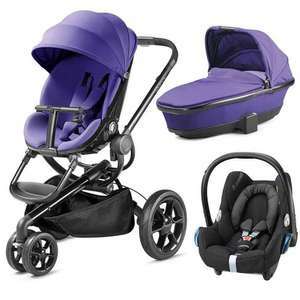 babies r us: quinny buzz xtra in the three colours, use voucher code 9908082499990 for an extra £20 off!! Shared Via The HUKD App For Android. Comment Have a day off!!! 300 notes for a weird looking pram? Bargain. Have some cold. Thanks, how long have you used it for - do you reckon it will be suitable for a tall-ish 3-4 year old? It's a bit heavy and requires lot of boot space. But otherwise it's very well built and fit for purpose. For people who have this - what's your review of it - I am confused by the negative reviews on the size and weight of it as such vs the comfort aspect? Argos Quinny double buggy £22.99* was £33.99 Shared Via The HUKD App For Android. This is really nice, my daughter has a pram but I bet she'd love a twin buggy. Perhaps she'll get one for her bday. Has anyone seen this in york store? That's a twin pushchair. Still a good bargain though! Great deal on Bounty purchased from Precious Little Ones regular price £610 with voucher code £369 including delivery!! Shared Via The HUKD App For Android. Baby inlays were £12 at kiddicare the other week. Whoop whoop! It is an AVERAGE price for an OLD model. If it was the buzz xtra it'd be a good price. was never 610, its old buzz. The cheapest I could find this toy was £49.99 and its nationwide in b&m for £34.99 great santy gift for little girls! I bought this last year at same price. The Quinny twin pushchair is also for sale at £29.99. Think I might need to invest for daughters birthday! Are we back to these stupid comments again. Hold on while I hop in my Delorean my get it at the cheaper price. do you happen to know if it will he even cheaper in future cos I might just go forwards in time to get it. Last few days of closing down sale. Had about 15 left this morning. Website is £165 and in store it is marked at £40. This was in the nottingham kiddicare store. There was not along left at all. A few cots at £11 and £14, a few over brand carry cots and car seats. As well as little bits like small teddies and boys crib set ( bumper, blankets etc). Almost bare. I went yesterday and the just had toys, a few cots and a few pushairs. 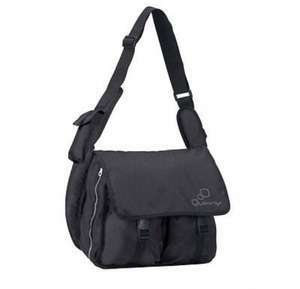 Also had a good few Oyster max carrycots in black.